Product selection is critical to the success of your private label brand. There are several considerations to make when choosing a product. In the last episode of the AM/PM podcast we discussed several ways to come up with product ideas; today we go over which products to avoid, and we also discuss some ninja research tactics that will help you hone in on killer products. How can I benefit from initially selling light items on Amazon? What type of products should I avoid when initially selling in Amazon? How do I use the Amazon Best Seller list to find what products to sell? What is BSR and how does it work? What is a good BSR range to aim for on the products to select? One of the easiest ways to select the right item to private label is to focus your search rather than to keep it wide open. By eliminating some bad categories you will quickly be able to pass on bad ideas and dedicate more productive time to good ones. A category you should cross off your list immediately is that of bulky and heavy products. When it comes to making money selling on Amazon, size and weight are of crucial importance. As far as the size of your item is concerned, it is important you choose a product that can fit inside a large standard size box (18” x 14” x 8”). Shipping costs increase dramatically if you exceed that size. An added benefit of small products is that inbound shipping will be lower too. Weight is equally important. When selecting your product, be sure that the total weight of the unit does not exceed 20 pounds, but make an effort to select products that are much lighter than that. Amazon considers oversized items all the items that exceed any of these size and weight specs. To be clear, an item can be light as a feather, but if it cannot fit inside a large standard size box, it will be deemed oversized. The same is true the other way around, if the item is small but heavier than 20 pounds, it’s still oversized. To learn more about what Amazon considers oversized items head over to their Product Size Tiers page. Because of the fact that Amazon has to store millions of products in their multiple warehouses, they put a limit on some seller accounts that determines how much inventory that individual seller can store there at any given time. That limit is significantly higher for regular-sized items than it is for oversized items. You can learn more about the Inventory Storage Limits in the FBA help area. I’ve tried to make it crystal clear for you, but in case I’ve failed and haven’t been clear enough, I’ll say it point blank: DO NOT start out with oversized items. Now that we have oversized products out of the equation, let’s talk about other products you might want to avoid. The following list should get you thinking on the right track, but before we go into it I want to stress that the reason we’re avoiding these products is not because they don’t sell well or they don’t make money; what we’re trying to do by avoiding these products is to mitigate the possibility of problems that may arise. For example: Amazon recently recalled thousands of “hover-boards” because of safety concerns. They gave sellers a deadline to remove the items from their inventory; items that were not removed on time were destroyed. Having to remove inventory or having it destroyed is never a good day for a seller. You should avoid selling toys and gadgets with moving parts. Products that have moving parts are more likely to be assembled incorrectly and be broken by the final consumer prompting returns. Electronics are susceptible to humidity, vibrations, impact, manufacturing problems and more issues that are out of your control. You should avoid electronics if possible. Fragile items, as the name implies, break easily. Having hundreds, or thousands of fragile items shipped across the country to multiple warehouses and to final consumers can be costly and is likely to result in some product loss. Liquids are also traditionally problematic. Chances are if you’re shipping liquids, you’ll have some product loss from spillage and leaks. Clothing can be a difficult product to start with. There are a lot of returns in the clothing market (specially when people are buying online). The problem is that brands have different sizes and styles; colors may not look the same on the picture as they look in real life, and buyers are very particular about the clothes they wear. A large number of returns also have a negative impact on your seller metrics, so it is best to avoid clothing at the beginning. Sharp objects can be a cause of concern as they could potentially inflict injuries on the final consumers, which in turn is a liability for the seller. Although these items can be very profitable because they’re consumables, there are a lot of liabilities that come with products that are ingested or applied to the skin. If you feel you must get into this market, be sure to have the products tested for safety and have proper liability insurance to protect your assets. This previous list is not comprehensive, and it sure makes me feel like a Negative Nelly, but my intention is not to discourage you; in fact, you’ll be surprised of the huge amount of items that do not fall on this list! If you took the time to read or listen to my last post, you should have lots of great product ideas already, or at least you know where to find these ideas; now it’s time to get ninja and go even deeper on our research. I had mentioned before that you should pay attention to Amazon and see what products are selling well, what’s new, what’s hot, etc.… A problem I see with many training courses is that they mention the bestseller list, but they don’t mention the fact that when a product is high on that list, the seller is probably very experienced, and they’re likely to be making a lot of money. These are NOT the competitors you want when you’re starting out. It is in your best interest to go further down on that best seller list (beyond the top 100) so that you see competitors you can actually beat on the short term if you do things right. When you find a product that interests you check the product’s Best Seller Rank (BSR). A product’s BSR is a reflection on how well it sells compared against other products in the same category. A good rule of thumb is to look for products between the 1,000 and the 5,000 BSR rank. If you go far below 1,000, you’ll likely be competing against well-established sellers with big marketing budgets and a large customer-base. If you go far above 5,000 you’ll probably struggle to make consistent sales as the volume of sales greatly decreases on this higher BSR products. Now that you’ve done your research, you found a product that fits the bill and you’re ready to pull the trigger take a moment to dig a little deeper. If you click on the brand name of the winning product you found, you’ll see all of the products that brand (or company) sells. In many cases you’ll be able to come up with great ideas on how you can expand your product lines by looking at what other successful sellers are doing. If you’re going to take on a competitor, you should order their product and have your eyes peeled for opportunities to improve upon what they are currently doing. If there’s not an instruction insert, does it need one? Did you get a follow-up email after purchasing? Did you have a compelling reason to visit their website and get on their mailing list? Was there anything extremely positive about this product experience you’d like to replicate with your product? Was there anything negative you must address with your product? 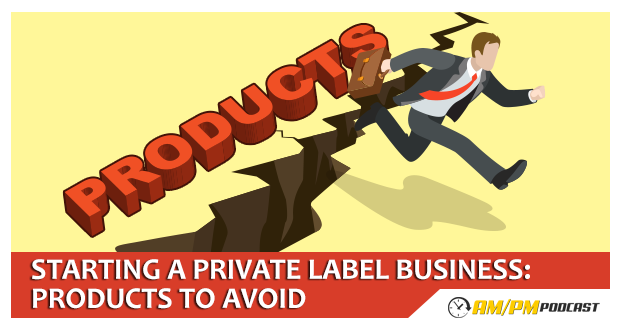 Having a successful private label product is not about copying what is already out there. It is about modeling and improving what is already successful and finding a way to differentiate yourself enough so your product stands out as the better option among the competitors. If you love the content I’m putting out I’d greatly appreciate it if you subscribe to the Podcast, Tweet about it or share it on Facebook. Now go out there, do your research and move forward in this venture. I love the fact you’re learning from me, but learning will get you nowhere fast. You must take action if you want your life to change. If you need more help, be sure to join our Facebook community where you’ll be able to interact with many other people like you and me.